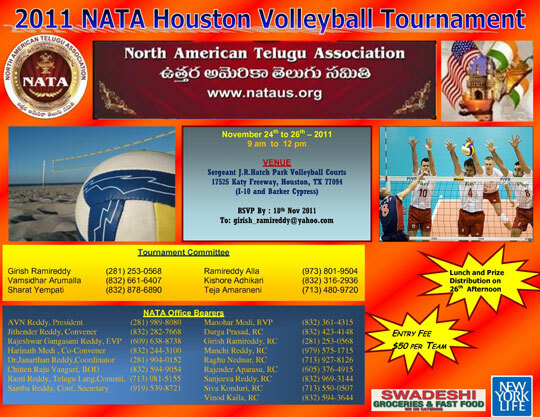 Houston, Texas: North American Telugu Association (NATA) has announceda 2011 NATA Houston Volleyball Tournament and the tournament will be held on November 24th – 26th at Sergeant J.R. Hatch Park Volleyball Courts, 17525 Katy Freeway, Houston, TX. This sporting event is led by Regional Coordinator Girish Ramireddy and being organized by NATA Houston Volleyball Committee consists of Vamsidhar Arumalla, Sharat Yempati, Kishore Adhikari, Teja Amaraneni and Rami Reddy Alla. NATA President AVN Reddy, Executive Vice President Rajeshwar Gangasani Reddy, BODs Chitten Raju Vanguri and Dr. Vintha Janarthan Reddy, RVP Manohar Medi, Standing Committee Chairs Samba Reddy, Rami Reddy, Regional Coordinators Durga Prasad, Manchi Reddy, Raghu Nednur, Rajender Aparasu, Sanjeeva Reddy, Siva Konduri, Vinod Kaila, NATA members from the Houston area are helping with this event. Volleyball tournament is being conducted to encourage the youth and spread NATA awareness in the Houston Telugu Community. NATA Convention team is very excited and very supportive to event; the convention team consists of Houston Conference Convener Jithender Reddy, Co-Convener Harinath Medi, and Coordinator Dr. Vintha Janarthan Reddy. This Tournament is being supported by generous donors including BOD’s, RVP’s, RC’s and NATA members and our corporate sponsors New York Life, Swadeshi Groceries and Fast food. NATA Houston Conference Convener Jithender Reddy acknowledged, this would bring a lot of enthusiasm in local Telugu Community and also the home town for 2012 NATA Houston Convention (June 29- July 1). 8 teams from Houston will compete in this wonderful sporting event. Preliminary rounds will be conducted on November 24th and 25th and Finals will be held on November 26th. The Volleyball trophy will be presented by the NATA Executive Committee at a special Awards Ceremony on the same day. The RVP Monohar Medi is very excited and appreciated is Regional Coordinators effort to conducting the event in Houston.